Superbowl XLIX was one of the most exciting I’ve seen in my 40 years. However this year will be remembered for a couple things; deflated balls and a “poor play” decision with the game on the line. Sports are tough since players and fans get overly emotional and a last minute loss can cause depression, invading individual’s personal lives. I’m guilty as I consider myself an honorary member of the Seattle Seahawks 12th man. Even though we won the NFC Championship 2 weeks prior with a miraculous comeback, I was in an emotionally trance for a few days replaying the last 2 minutes. This year’s Superbowl was the same where we had it won, even after giving up the lead with minutes left in the game. We just had to continue our momentum and give the ball to Marshawn Lynch (Beast Mode) to plow through one final yard to the end zone for the Hawks to be back-to-back champions. Not so much, the decision was made to throw a short pass, which was intercepted by the Patriots, thus deflating Seahawks fans around the world. There’s a great lesson to be learned from all of this. You learn a lot more from failures in life. You just don’t think as much about the successes as you do the failures. They haunt you, you replay them and figure out ways to avoid them in the future. In the military and in the mountains you live and die by the decisions you make. You’re given information within your reach (possibly some additional intelligence) and based on your experience you calculate your risks to ensure you and your team come out alive. In some cases you avoid the risk completely due to it’s greatness (i.e. weather conditions on a mountain). Hindsight is perfect, especially to everyone not involved in the process, but in the moment you make the decision and live with the consequences. For the Seahawks it didn’t work out so well, but in the end it’s a game and nobody loses their lives. Players and fans may go through the stages of grief (denial, anger, bargaining, depression, acceptance) but time will heal. In the military, business and mountaineering I’ve worked with some good and bad decision-makers, but the worst of all are the ones that sit on the fence paralyzed by choices. I have a lot more respect for someone that makes a wrong decision than one that refuses to make one. Progress, to me, is moving forward or back. Even if you make a mistake and move back, you’ll learn and be better moving forward. I’m happy for Tom Brady and the Patriots, as they are a solid team. In any competition there are winners and losers. Losing stinks, but it’s an opportunity to embrace the moment, gain some perspective and come back stronger! The Seahawks have been very professional and classy, all taking credit for the team decision. 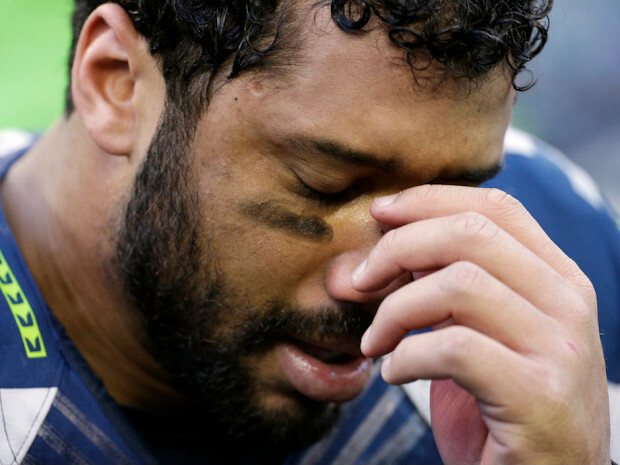 Russell Wilson continues to impress me with his consistent behavior as a faithful leader on and off the field. We definitely need more role models like him in the world. Go Hawks! Everything you said is right on. The Seahawks are an amazing bunch of guys who have given us so much excitement. Besides just their athletic talent, they always impress me with how they support each other as a team, their faith and their attitude. Of course it’s sad that they didn’t get the trophy, but they have more than proven that they are made of champion material, and everyone knows it. So excited to see “whats next”.